3 on a Page QuickBooks Checks - Add B/W Logo for Free! Get high-quality 3 on a Page QuickBooks Checks delivered to your home or office. Customize by selecting from a wide range of different paper colors, adding a company logo, or requesting an extra line for signature. Add black and white logos for free! More info about lines on check. Upload your signature scan here or email it to us at logo@checkomatic.com. I'm very pleased with my order. Customer service and shipping speed is excellent! 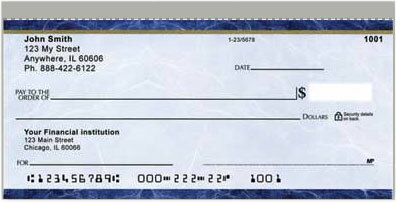 We received our order and are happy with the checks. The logo we added turned out perfectly! Our checks arrived and look great as always. I am always very pleased with my orders from checkomatic. Thank you! You guys is good and fast, good work.. Thank you for your great products. My checks turned out even better than I had hoped. You can definitely count on me being a return customer! my order was great. Thank you.